Calls for resignations and for NHS pay vote to be rerun as Royal College of Nursing chief admits they gave incorrect pay deal information. Furious members of the Royal College of Nursing last night launched a petition calling for the union’s leaders to stand down over their handling of communications about this year’s NHS pay deal in England. OurNHS understands the petition is well over halfway to the required number of signatures to trigger an emergency general meeting, another of its demands. It was started after the head of the RCN, Janet Davies, last night took the unprecedented step of writing to members to apologise that they were given incorrect information about the pay deal that they voted on in the spring. Ms Davies acknowledged that many have received less than the RCN told them they would. Her email comes after OurNHS exposed last week that many NHS staff felt disappointed and upset as it emerged that many would not immediately get the full pay rise they were expecting. "I wanted to write to you myself over the recent NHS pay deal. It has come to my attention in the last 24 hours that the deal was not as straightforward as we said and for that I offer you a sincere personal apology. Ms Davies went on, "I can assure you that I am demanding answers for you. In the meantime, I can only apologise for this unnecessary confusion and assure you that I am determined to resolve it. Your elected Council and Trade Union Committee will be meeting in the next few days and I will update you on next steps." Along with the other main unions, apart from the GMB, the RCN had recommended the pay deal to members. Last night there was renewed fury amongst RCN activists and members. Anthony Johnson, a health visitor, RCN member and former ‘pay champion’ (members who help organise local action around pay) told OurNHS that the RCN “shouldn’t have trusted the government… It seems like they’ve just gone for the deal and been screwed over, but they’ve sold the deal so it’s their fault”. Asked about the assertion by some unions that the deal was understood, Mr Johnson replied, “No way is that true that staff understood. People were still passing around incorrect information right up till the vote.” Many staff have been making similar comments both to OurNHS and on social media in recent days, as payslips land on NHS staff doorsteps this week. Danny Mortimer, head of NHS Employers, told OurNHS today that this was “an issue between the RCN and its membership”. He said, “The letter states that the RCN has in error told members in one of its documents that they would all receive ‘a 3 per cent uplift this summer’… This miscommunication is very unfortunate and clearly the RCN will need to review all of its communications to understand the extent of its error.” In response to a specific question NHS Employers confirmed to OurNHS that a poster showing the apparently higher pay figures (ie, including a full year's increment for those staff not at the top of their bands) was put up on their website 21 March and taken down on 13 June, and told us that “materials explaining are regularly updated in light of feedback and questions". The pay offer came at a point when the government was under considerable political pressure. After one of the hardest winters in NHS history, union leaders were loudly pointing out that eight years of zero or 1% pay rises (a real-terms cut of 14% after inflation) was contributing to serious and worsening staff shortages. For months, nurses had been warning the government that unless pay was addressed properly they would take historically unprecedented strike action. Four out of five nurses were prepared to strike over pay, according to an initial RCN ballot of its members during the 2017 election campaign. The government’s pay cap was widely seen by commentators to have contributed to the Tories’ poor performance in that election. Asked during the campaign why nurses were having to rely on foodbanks, Theresa May told the BBC that there were “many complex reasons”—a response for which she was widely criticised. Some staff who did ask questions told OurNHS they got short shrift. Mr Johnson says that when he raised questions about aspects of the pay deal, including unsocial hours payments, he was told “you don’t understand maths”. NHS Employers told the Health Services Journal last night they were “disappointed” at the RCN’s email to its members yesterday, and “surprised as no concerns were raised with us”. In a separate statement NHS Employers focused on a separate issue, which is that whilst the pay deal will be applied to this month’s pay packets, staff won’t get the backdated pay till August rather than July. The RCN represents 435,000 members. 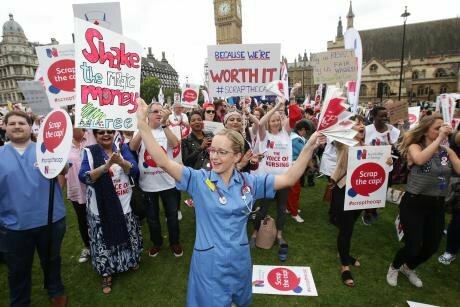 This week NHS doctors are also up in arms about their own, separate pay deal, as it emerged on the last day of Parliament that they, like other public-sector workers including police officers, would this year receive a below-inflation rise of 2%. This is less than the independent NHS Pay Review Body recommended, and comes after doctors, like other NHS workers, have endured years of pay austerity.